Over the years, UVEXS has manufactured thousands of power supplies and lamp houses used in a wide range of industrial applications. Historically the mercury arc lamp has been used because of its high UV output and reliability. Around 2010 the industry started to change with LED Light Emitting Diode technology. Prices continue to drop, making LED systems more affordable and convenient to use. Many researchers are now exploring how to use the LED technology and industry is following quickly behind them. UVEXS manufactures LED modular systems that can include up to 4 wavelengths per module. Tried and proven, the plasma lamps are normally mercury medium pressure lamps or doped lamps that take the mercury plasma lines down to longer wavelengths. Often, the needs of our customers are not understood unless prior history dictates a specific approach. UVEXS engineers are available to help customers determine their needs for intensities, wavelengths and production throughputs. Modular curing units come in various sizes including the smaller, Small Area Cure (SAC) or larger OCU configurations. These modular units are designed for integration and placement into existing equipment or onto inline production conveyance systems. The shuttered lamphouse opens to allow UV energy to expose the inks or adhesives needing to be cured. Closing the shutter protects the substrate when the conveyor is down from excessive heat or UV energy; exposure can be initiated via foot switch, external switch closure or from computer (PLC) control. Manufacturing equipment configurations such as rotary tables, material conveyor systems, high speed conveyances etc., utilize modular curing units effectively. Integration is straightforward using installation outline drawings and by having conversations with our engineering staff to configure the system for best use and efficiency. Plasma lamps are designed for integration into existing process equipment. 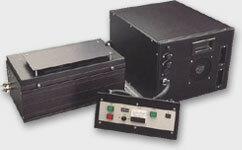 The UV source provides high intensity, full spectrum UV energy (200 – 400 nanometers). UV curable inks, coatings, adhesives and potting materials are rapidly cured with no surface tackiness. The modular components include quick mounting bolt patterns and Mil Spec connector interfacing for simple PLC interconnect. The Model OCU Series reflects engineering excellence from design through final performance testing. OEM arrangements are available through UVEXS that are backed by engineering and technical support to assist with immediate and long-term service needs. * Remote placement of operating controls and power supplies. * Various optic packages: direct UV exposure with various I.R. filtered for heat control on heat sensitive substrates. POWER SUPPLY MODULE The regulated ballast type power supply is mounted in a separate forced air-cooled cabinet. Standard power levels for the lamp are 150, 200 and 300 watts / inch. The system operates at 208-240 VAC, 60 Hz, single phase or 420-440 VAC, 3 phase as required; optional 50 Hz available. Current varies with lamp size and power level; consult UVEXS for specifics. The cabinet type varies with kilowatt requirement. OPTIONAL FEATURES SHUTTER Exposure control is available with an internally mounted knife blade shutter, compatible with all reflector configurations. Includes an internal pneumatic cylinder to drive the shutter plate, adjustable OPEN/CLOSE rate, and high temperature bearings on stainless steel shaft to assure reliable operation. Input requirement: 70-90 psi clean dry air or nitrogen. VARIABLE REACTOR Provides continuously variable power control for the UV lamp. With the system set on HIGH power the variable control range is 150-300 (optional 450) watts per inch. Monitor / control circuit available for PLC operation of lamp power level. ‘READY’ SIGNAL INTERFACE Optional control card allows power level monitoring for process interlock during lamp warm up. Additional circuits available for allowing PLC control of system operating functions. Type of substrate, size, chemistry if known…heat sensitivity.